Yeasts are eukaryotic, single-celled microorganisms classified as members of the fungus kingdom. The yeast lineage originated hundreds of millions of years ago, and 1,500 species are currently identified. They are estimated to constitute 1% of all described fungal species. Yeasts are unicellular organisms which evolved from multicellular ancestors, with some species having the ability to develop multicellular characteristics by forming strings of connected budding cells known as pseudohyphae or false hyphae. 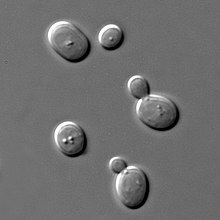 Yeast sizes vary greatly, depending on species and environment, typically measuring 3–4 µm in diameter, although some yeasts can grow to 40 µm in size. 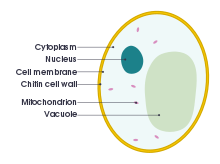 Most yeasts reproduce asexually by mitosis, and many do so by the asymmetric division process known as budding.